Gastroparesis is a condition in which the food in your stomach empties at a delayed rate. This can cause uncomfortable gastrointestinal symptoms and even lead to malnutrition. While there are medical treatment options, a new diet is typically the most effective way to manage symptoms. This article looks at what is the best diet for gastroparesis based on current knowledge and evidence. It includes a sample diet plan and some thoughts about the low FODMAP diet too. 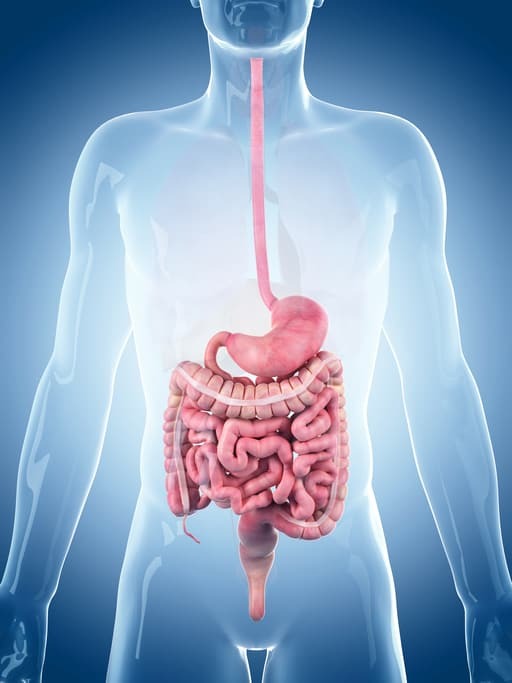 What is Gastroparesis (Delayed Gastric Emptying)? Gastroparesis is a term used to describe slowed stomach emptying. In fact, it is also commonly called delayed gastric emptying or simply GP for short. This means that food entering the stomach stays there for extended periods of time before moving along to the rest of the digestive tract. It’s a condition that impacts about 4% of the U.S. population (1). Gastroparesis symptoms can range from mild to severe depending on the degree of stomach paralysis. Cases of severe and untreated gastroparesis can result in dehydration, altered blood sugar levels, malnutrition and unintentional weight loss. With gastroparesis, vagus nerve and/or muscle damage may impair the stomach’s ability to contract and release properly. This means food and fluid in the stomach remain there for longer, hence the term “delayed emptying”. While the first line of treatment typically involves a change in diet, there are also various prescription drugs that target symptoms or work to stimulate the muscles controlling stomach emptying. To help manage symptoms: Promotility and anti-nausea drugs are often used, including metoclopramide, domperidone, prochlorperazine and promethazine. To manage pain: NSAIDs, low-dose cyclic antidepressants and nerve-blocking drugs can also be taken. To help stimulate muscle contraction: Medications like cisapride, domperidone, metoclopramide or erythromycin may be prescribed. In case drugs are ineffective, a pacemaker may be recommended. Pacemakers electrically stimulate stomach muscles and seem to be most helpful for those with diabetes-related gastroparesis. In rare cases, surgeries like partial gastrectomy and pyloroplasty are used (2). 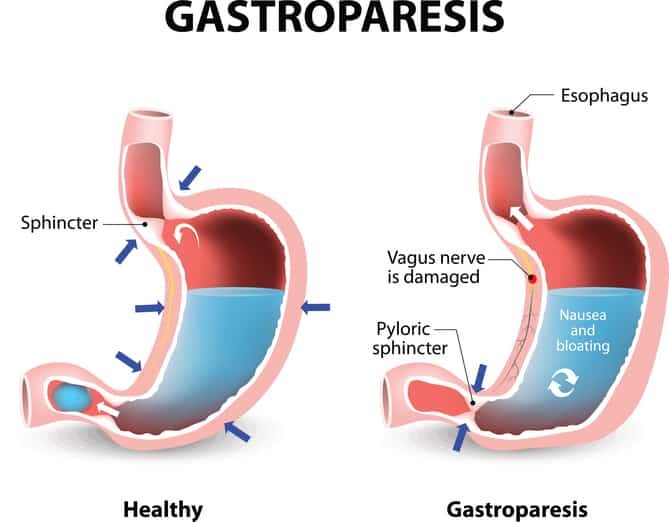 Summary: Gastroparesis results in the slow or delayed emptying of food in the stomach, and arises from nerve and/or muscular changes in the body. Along with a recommended diet change, drugs may be prescribed for symptom and pain management, stimulating muscle contractions and controlling underlying conditions. Blood tests, upper endoscopy, stomach X-ray and ultrasound are typically performed to help rule out any potential stomach obstructions. After that, stomach-emptying tests are used to measure the rate in which food leaves the stomach. These tests include scintigraphy, breath testing and a wireless motility capsule (SmartPill). This test assesses gastric emptying rate and is the ideal choice for diagnosing gastroparesis. You’ll eat a small, bland meal consistency of some radioactive material. After, the abdomen is scanned to track the speed of the meal leaving the stomach. If over 10% of the meal is still in the stomach after four hours, then gastroparesis is typically confirmed. If you prefer a non-radioactive diagnostic approach, try the breath test. You’ll eat a meal that contains carbon-13 stable isotope. This labeled gas can then be measured through the breath to help calculate gastric emptying rate. This high-tech assessment is also called a SmartPill test. You’ll swallow a capsule that transmits data about your digestive process to a small receiver. The capsule is naturally excreted after about two days. Summary: After your doctor has ruled out other potential digestive issues, they may perform a scintigraphy, breath or SmartPill test to help confirm the diagnosis. 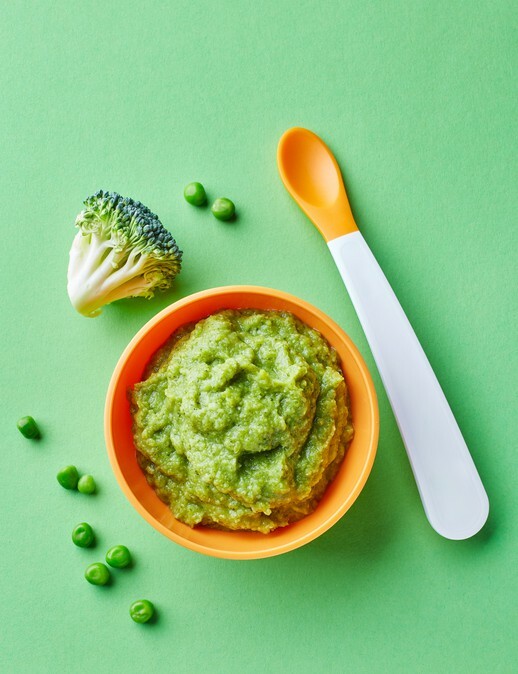 While there is no one best diet for gastroparesis, there are specific strategies that help support digestion and stomach motility. Liquids: Thin liquids like water, broth and juices rapidly empty the stomach. They require little to no digestion and use the effect of gravity to move down to the small intestine. 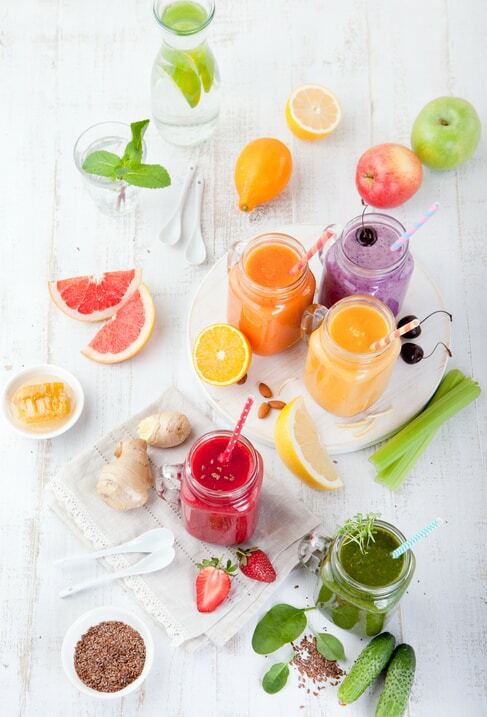 Thicker liquids such as pureed soups or smoothies empty at a slower rate. Solids: Solid food requires more work for the stomach, which needs to break it down to pass into the small intestine. This process slows stomach emptying. Nutrient Composition: Fiber and fat-rich foods and oils also take longer to empty from the stomach. Carbohydrates can pass through the quickest, followed by proteins (3). Food Temperature: The temperature of food when it enters the stomach affects when it leaves. Hot meals and beverages will exit the stomach faster than cool foods and liquids (4). With these concepts in mind, a three-phased diet approach is often recommended for those with gastroparesis. Lasting less than three days, the first phase consists of thin liquids and saltine crackers. Calories are inadequate, typically under 800 daily, so this phase should last no longer than three days, unless additional nutrition support is included. Gatorade, ginger ale and other sodas, broths, juices and water are consumed. Since you’ll only be meeting your fluid and electrolyte needs these days, it’s important to follow this phase under the supervision of your healthcare provider. Fat intake progressively increases up to 40 grams daily. Calories may still be less than adequate, but should slowly increase as tolerated. This phase typically lasts 4-6 weeks, but depends on the degree of improvement in your symptoms. Food choices may include fat-free dairy, thicker soups, grains (not whole grains), eggs, peanut butter (limit to two tablespoons), fruit and vegetable juices, canned fruits, peeled and well-cooked veggies, and low-fat desserts (puddings, frozen yogurt, gelatin, popsicles, etc.). Calorie and fat intake increases up to 50 grams daily. This is considered a maintenance phase, and should still be monitored and modified under the care of your healthcare professional. Continue focusing on a low-fiber diet and eating smaller meals spaced throughout the day. Tailor the diet to meet your specific nutritional needs. In case your needs are not fully met on this plan, talk to your healthcare provider about using a multivitamin or mineral supplement. In severe cases, short- or long-term enteral (feeding-tube) or parenteral (intravenous) nutrition may be required. Eat Small, Frequent Meals: This allows you to meet your calorie and nutrient needs without overfilling the stomach. You’ll feel less bloated and uncomfortable with smaller portions of food. Chew Your Food Well: This will help relieve your stomach from overworking to break down food. When food is broken down by your teeth it also has time to mix with salivary enzymes to “pre-digest” before being swallowed. Take Advantage of Gravity: By remaining upright and going for a light walk after eating, your food is more likely to be pulled down into the small intestine to continue digesting. Avoid eating too late at night and/or taking naps or reclining in a chair after eating. Consider Liquid-Meal Replacements: Products like Ensure and Boost or homemade protein shakes or smoothies can help you meet your calorie needs. Avoid High-Fat Foods: Skip the fried foods, high-fat meats, full-fat dairy and baked goods. Instead, enjoy limited amounts of healthy fats like extra virgin olive oil, avocado, nut or seed butters and fatty fish. Limit Fiber Intake: Avoid high fiber foods like whole grains and legumes (e.g. beans, peas, lentils), as well as the skins and seeds of fruits and veggies. This helps reduce the risk of developing bezoars, which can cause stomach blockages. Enjoy Your Nuts & Seeds Pureed: Nut and seed butters are more easily digested than whole nuts and seeds. But don’t overdo these if you’re trying to lose weight— they’re still high in fat and therefore high in calories. Choose Nutrient-Dense Foods: Since every calorie counts, don’t waste them on junk food. Choose 100% juice, low-fat dairy products (e.g. yogurt, cheese, milk), peeled fruits and vegetables, lean meats and seafood. Occasional intake of treats is okay, focusing on lower fat options like rice krispy treats, low fat pudding and angel food cake. Avoid Alcoholic Spirits: Drinks like vodka, rum, tequila, etc., can slow gastric motility (5). Summary: While there’s not one best diet for gastroparesis, you should aim to eat slowly and enjoy small frequent meals. You must also choose nutrient-rich foods that are low in fat and fiber. Below is a sample meal plan you may follow, though it should be adjusted for your specific calorie and nutrient needs. If you have implemented all the above strategies with little success, there is one other option. 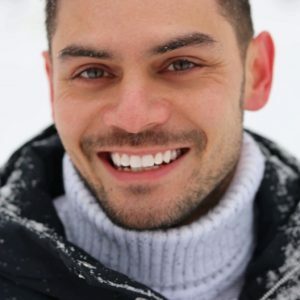 The main symptoms of gastroparesis (particularly bloating) greatly overlap with those of irritable bowel syndrome (IBS) and small intestinal bacterial overgrowth (SIBO). Both these conditions can be treated with a low FODMAP diet, among other things. In fact, there is evidence that those with gastroparesis are much more likely to have or develop SIBO (6). Given the overlap, some doctors and even patients have begun to wonder if minimizing FODMAPs will also help with this condition. I was unable to find any scientific literature yet, but theoretically it makes sense that it would help. You can learn all about the low FODMAP diet here. Gastroparesis slows down the rate at which food in the stomach empties. It’s often due to conditions that impair the nerve and muscle functioning of the stomach. While medical treatments are available, dietary change is the initial and ideal option. The best diet for gastroparesis typically depends on the severity of the condition. 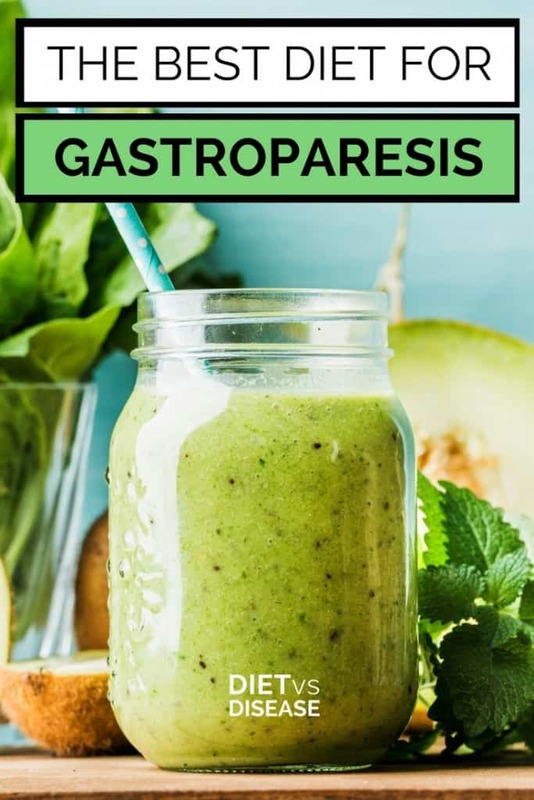 Initially you may consider trying the three-phased gastroparesis diet, which starts with clear liquids, and then slowly progresses to a maintenance plan of nutrient-rich foods. When symptoms are acting up, it’s generally best to eat smaller meals, limit fiber, choose low-fat options and consider liquid meal replacements as needed. You can also consider trialling a low FODMAP diet if nothing else has helped. Making these simple changes to the way you eat can go a long way to successfully managing gastroparesis. Erin Peisach, RDN, CLT attended the University of Maryland, College Park for her Bachelor's degree in Dietetics. She is now the owner of Nutrition by Erin, a San Diego-based virtual nutrition private practice specializing in gastrointestinal disorders.